Scientists around the world soon realized the amount of damage the chlorofluorocarbons were doing to the environment. August 17, 2016—-Ultraviolet radiation is high intensity energy that Earth receives from the Sun. 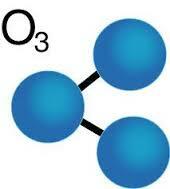 Ozone (O-3), high in the stratosphere, filters out much of this ultraviolet radiation. Part of this high-energy portion of the ultraviolet radiation spectrum is known as ultraviolet-B (UVB). Although the atmosphere blocks most UVB radiation, it does not block all of it. This UVB radiation is very harmful to living organisms. Any reduction in atmospheric ozone lets more ultraviolet radiation through the atmosphere to reach the surface. Plants did not flourish on Earth until there was enough atmosphere and ozone to block much of the UVB radiation. All plants and animals now existing and living in sunlight have adapted to ultraviolet radiation in some manner. However, they vary widely in their tolerance of UVB. Plants that developed in climates with high-intensity sunlight show a variety of defense mechanisms for UVB. Some produce pigments that absorb UVB radiation. In arid climates, plants develop thick, shiny leaves. Cacti and olive trees are examples. Most living organisms are subject to damage if UVB radiation increases. Since plants cannot adjust their behavior to changing solar radiation they are vulnerable to increases in UVB radiation. Animals have also adapted to UVB radiation. Nearly 90 percent of marine species living in the surface water surrounding the Antarctic Continent produce some form of chemical sunscreen. Humans have adapted to UVB radiation by manufacturing melanin in the skin. This is a pigment that blocks ultraviolet radiation. A summer tan results from increased production of melanin. Persons with very fair skin do not readily manufacture melanin and sunburn very easily. Over exposure to ultraviolet radiation results in aged skin, skin cancer, and a weakened immune system. The risk of skin cancer is much greater from overexposure by a sunburn than from steady low doses. A single blistering sunburn in a person 20 to 30 years of age triples the risk of skin cancer. The risk of getting skin cancer can be reduced with reasonable care. The first rule is to avoid exposure to the midday sun. The most dangerous hours are between 10 A.M. and 2 P.M. There is an old saying: “Only mad dogs and Englishmen go out in the noonday sun.” If exposure to the sun is necessary, using a sunscreen with a rating of 15, based on Ultraviolet-B radiation, helps reduce skin damage. In 1974, scientists warned there was evidence to suggest that compounds known as chlorofluorocarbons (CFCs) were having a depleting effect on stratospheric ozone layers. These compounds are not natural compounds. First synthesized in 1928, these compounds promised to have many uses. They are odorless, nonflammable, nontoxic, and chemically inert. They first came into use in refrigerators in the 1930’s. Since World War II, CFCs have been used as propellants in deodorants and hair sprays, in producing plastic foams, and in cleaning electronic parts. They do not react with most products dispersed in spray cans. They are transparent to sunlight in the visible range. They are insoluble in water and are inert to chemical reaction in the lower atmosphere. For these reasons they are valuable compounds. Chlorofluorocarbons rise into the upper atmosphere where they break apart under ultraviolet radiation. This breakdown releases chlorine, which interacts with oxygen atoms to reduce the ozone concentration. The most disturbing reduction in atmospheric ozone is that found over the Antarctic Continent and is referred to as the ozone hole. The ozone hole over Antarctica has occurred in September and October since the late 1970’s. During the Antarctic spring, there is a decrease in ozone north from the pole to nearly 45° south latitude. In August and September 1987, the amount of ozone over the Antarctic reached the lowest level recorded to this date. 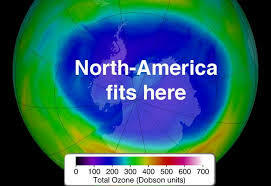 In the fall the ozone hole covered nearly half of the Antarctic Continent. The same process takes place elsewhere in the atmosphere, but at higher altitudes and at slower rates. Ozone depletion is less outside the Antarctic, where the difference is significant. There is no Arctic ozone hole like that of the Antarctic. Temperatures are warmer, and there is more variable weather in the Arctic which provide less favorable conditions for the necessary chemical and circulation processes. Ozone depletion contributes to global warming. The additional ultraviolet radiation reaching the earth’s surface adds heat to the lower atmosphere. Scientists around the world soon realized the amount of damage the chlorofluorocarbons were doing to the environment. The U.N. Environment Program called a conference in Montreal, Canada, in September 1987, that drafted a treaty restricting the production of CFC’s. 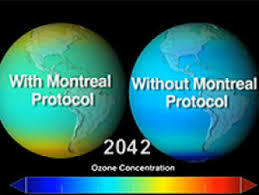 The agreement is officially termed the Montreal Protocol. International support for the treaty led to a substantial reduction in CFC production. The reduction in CFC’s has led to a decline in the amount of UV radiation getting through the upper atmosphere. The average size peaked in the 1990’s. Evidence now indicates that the average extent of the Antarctic ozone hole is declining. In the Antarctic spring of 2015, (September and October) the extent of the hole was only about ½ of what the previous maximum area had been. Hopefully, the size of the hole will continue to decline. NASA has indicated that it might be gone by 2050. This accord shows that international cooperation can occur with respect the environmental problems. The Paris Conference on climate change can make a huge difference to global warming and climate change if the signatories follow through on their commitments. Categories: Climate Change, Renewable Resources, Sustainable Education | Tags: #Antarctica, #Ozone, Arctic, Climate change | Permalink.